Description: PURCELL OK April 1974 -- SDP40f 514 accelerates away from the station with Amtraks southbound Lone Star. Description: AMTK 514 looks out of place parked between two repainted sisters. Description: AMTK 514 leads a "San Diegan" into LAUPT. Description: AMTK 514 is moments away for completing another run. 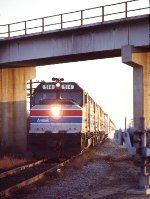 Description: Amtrak SDP40F 514 on an unknown day in June 1978 on the southwest side of Chicago, Illinois, Ektachrome by Chuck Zeiler. Description: Amtrak train 15, the southbound Lone Star behind SDP40F 514 & 526, is backed into Union Station by GP7 762 (not yet repainted from it's Precision National livery) in preparation for departure to Houston, as seen from the Polk Street bridge, Chicago, Illinois, USA, 11 August 1978.